Courtesy: Farrar, Straus and Giroux. Stockbridge, MA, November 22, 2017—Norman Rockwell Museum will look at the career of Prince Valiant cartoonist John Cullen Murphy during a special talk to be held at the Museum on Saturday, December 9, starting at 2 p.m. 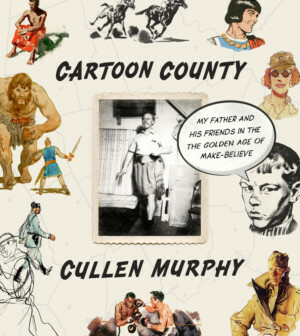 Author Cullen Murphy, whose new book Cartoon County looks at the artistic career of his father, will talk about the many illustrators and cartoonists who resided in the southwestern corner of Connecticut. In addition to the popular comic strips Prince Valiant and Big Ben Bolt, John Cullen Murphy received training from Norman Rockwell, and lived near other artists behind such classic comic strips and gag cartoons as Superman, Beetle Bailey, Snuffy Smith, Rip Kirby, Hagar the Horrible, Hi and Lois, Nancy, Sam & Silo, Amy, The Wizard of Id, The Heart of Juliet Jones, Family Circus, Joe Palooka, and The Lockhorns. The talk will explain how the work of these cartoonists was a pop-cultural force, and their talents had been forged, in part, during service in World War II. A book signing will follow the program, which is free for Museum members or included with Museum admission. Cullen Murphy is the editor at large at Vanity Fair and the former managing editor of The Atlantic Monthly. He is the author of The World According to Even, Just Curious, and God’s Jury. His latest book, Cartoon County: My Father and His Friends In The Golden Age of Make-Believe was recently published by Farrar, Straus and Giroux.